Delighten can build you a website that you can edit yourself via a Content Management System (CMS). If your website needs regular updating, a CMS can significantly reduce your costs and make your updates faster. We build websites with the WordPress Content Management System, as used by 15% of the top million websites in the world. 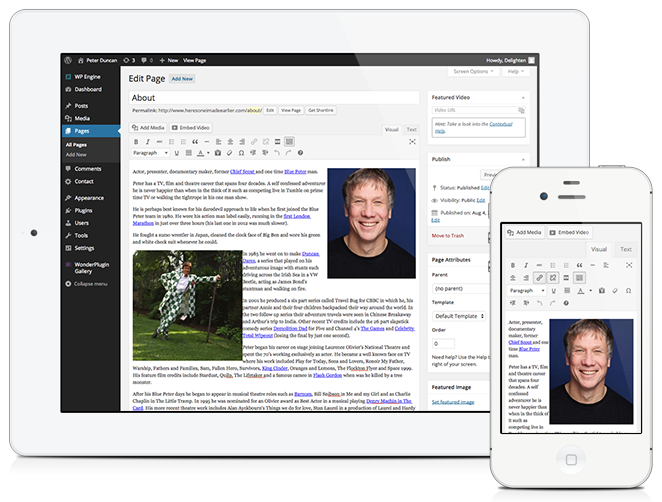 WordPress is used by millions of normal people to edit their websites every day. No technical knowledge is required. Over 60 million websites use WordPress, so it’s not going anywhere, and it’s being developed all the time. WordPress has the largest selection of CMS plugins – over 24,000 – which can be used to extend your website: from image galleries to shopping baskets. WordPress is free and open source software. This means you’re not paying extra to buy a Content Management System or pay for an ongoing license. There are smartphone applications to edit your WordPress site for iOS, Android, Windows Phone, Blackberry and more.